Maybe it is because my life is currently on hyperdrive where I am focusing on completing tasks, but I don’t see a lot of interesting stories happening in my life right now. Which means, I’ll have to find a story somewhere else to tell. Which means I’ll have to slow down long enough to see a story going on around me. Maybe it is because I was an English major in undergrad, or maybe it is because of all those books I read, but I don’t think I think visually. I think I think in words. I have a very visual memory, but it is more natural for me to present a story through prose rather than visuals. I am approaching this project from the mindset of the graphic novels I read last quarter. Maybe there is something there that I can use here. What AM I passionate about right now? The biggest challenge here is finding something physical to take photos of. At least with writing when you need something you can just create it out of thin air. A story should be more than progression, so watching the birds build a nest in the tree and then hatch their babies isn’t really a story, it is just a timeline. Something interesting should happen. My office is moving buildings soon. Maybe that would be an interesting story. Still, there is risk we don’t move and then I have nothing. Or, maybe the story isn’t interesting at all. Maybe I’ll tell the story of the Midsummer Renaissance Faire. That could be perfect. Maybe there wouldn’t be a “story” per se, as in maybe there wouldn’t be an arc. On the other hand, maybe I could craft one out the photos I take while there. I will be attending the Midsummer Renaissance Faire in early August. I think this event will contain fascinating stories of a time long past and how modern-day people pay homage to that time. I know that people dress up for this event, there are reenactments and other performances including, arts, magic, dancing, equestrian acrobatics, and more. I will spend a day at the faire absorbing everything it has to offer and clicking away the camera. Throughout this, will be able to create a story of pounding hooves of Knights horses, clinking of mugs of ale with the Ale House Wenches, puppets performing magic, thundering booms of pirate’s cannons and dancing faeries! I too may be transported to another time and place throughout the day, eating foreign foods while listening to foreign music and tales of another time. If the faire isn’t enough, just the drive to get there will be an experience! I hear a vital road will be closed and we will have to navigate our way through unfamiliar Bonney Lake. We may even have to stop for refreshments or fuel. The tale is not yet told, but will surely be a day to remember. Plated served me several targeted Facebook ads before I decided I would check them out. Being someone who doesn’t like going to the grocery store, doesn’t really have a lot of cooking experience, is single and short on time, I am exactly their type of customer. 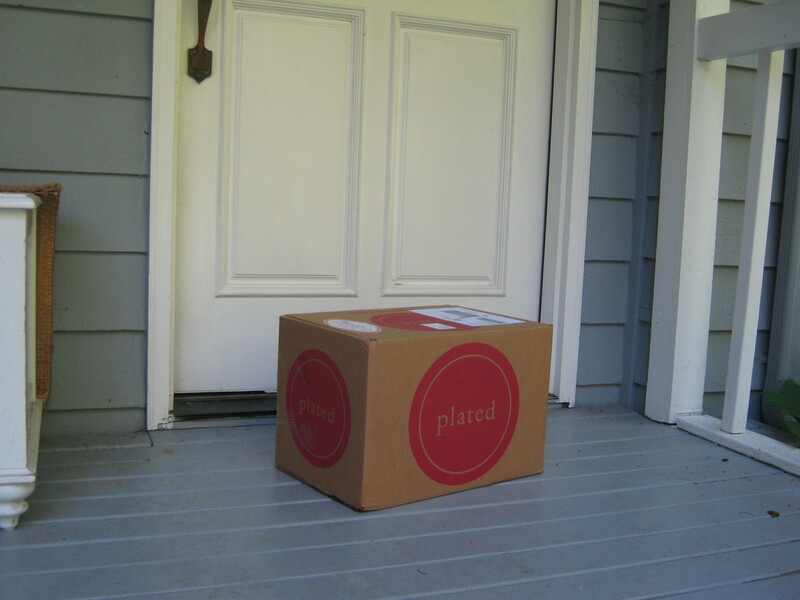 Plated delivers (almost) all the ingredients you will need two-serving meals right to your door. It eliminates the need to go to the grocery store to pick up all the ingredients for a healthy, and in my opinion, fancy home-cooked dinner. Their prices are reasonable –with a monthly membership ($10/month) and ordering about 4 meals a week, or 16 per month, the average cost per meal comes out to about $13/serving. 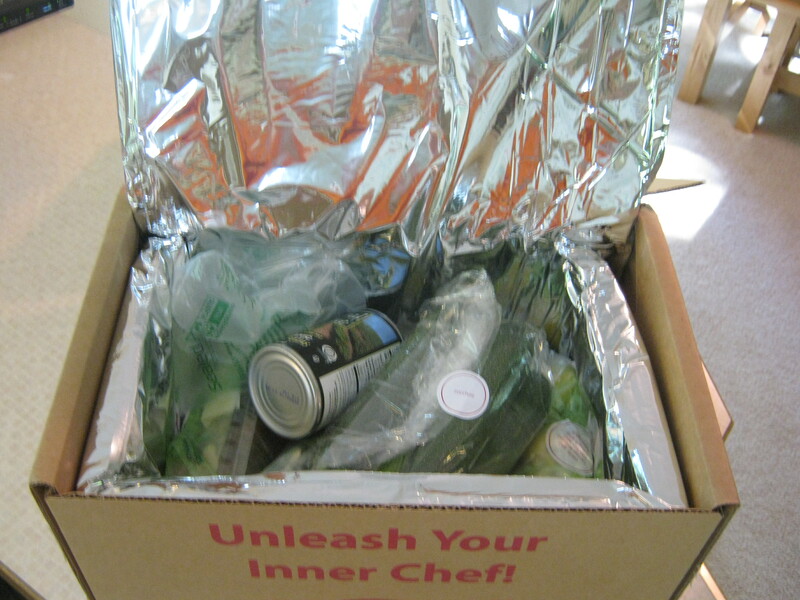 Not bad, considering it is delivered, there is no waste (assuming you eat your food) and the ingredients seem to be very high quality, considering they are shipped. 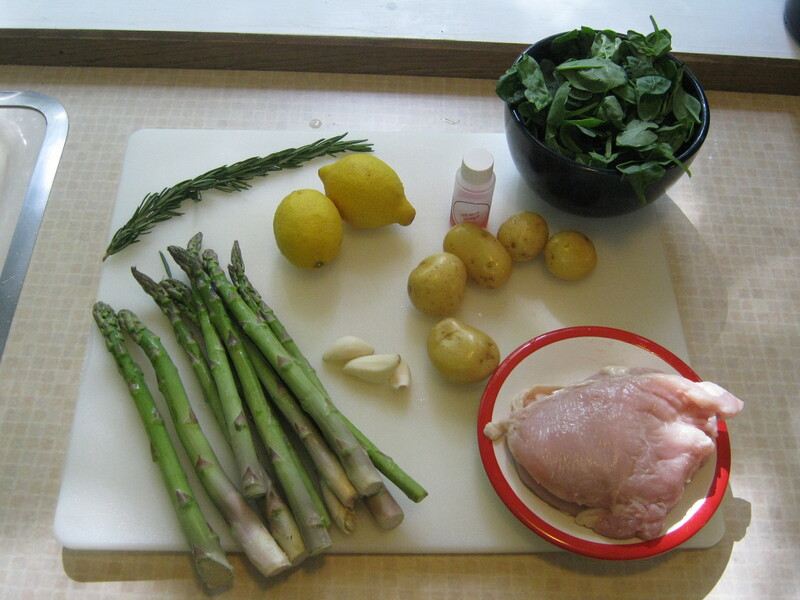 For my first box, I decided to order 2 servings of Garlic and Lemon Roasted Chicken with Spinach and Asparagus. 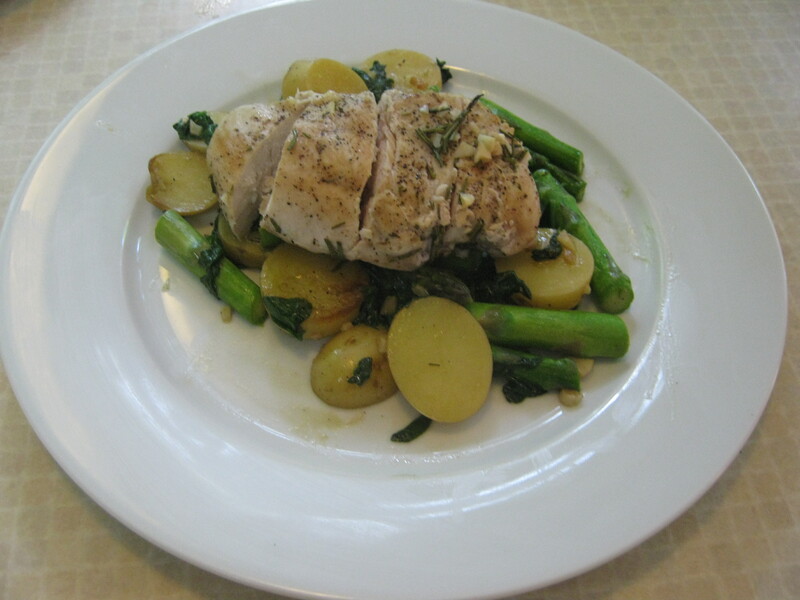 This is something that I would never have undertaken to cook myself, had not all the ingredients been bundled together. There are a total of 8 ingredients for the recipe, which, buying at the grocery store, would have amounted to much more than $26 ($13/serving). I was thrilled when my first box arrived at my doorstep and was excited to see if it would really be like they said on the website. 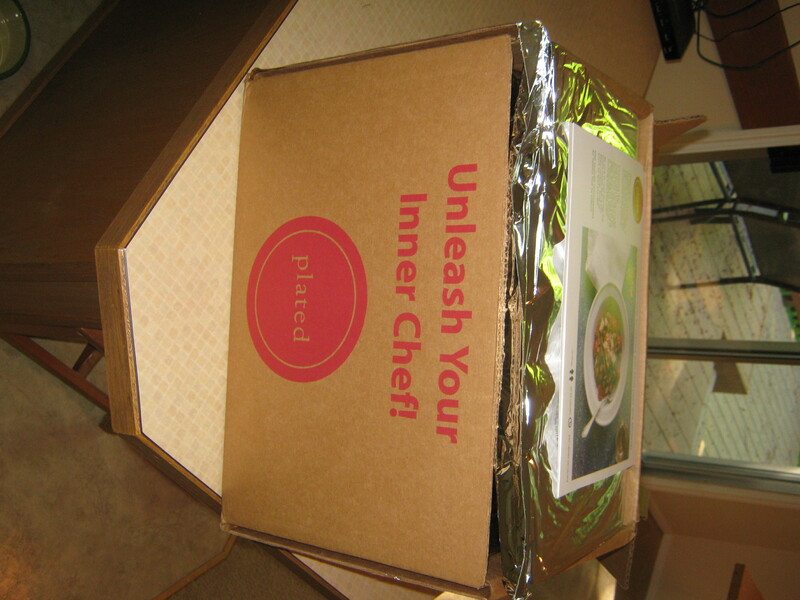 When I opened the box I was impressed by the organization and how well insulated it was. Of course, you would hope this was the case since they were delivering raw chicken, but you never know what you’re going to get when you order something off the internet. 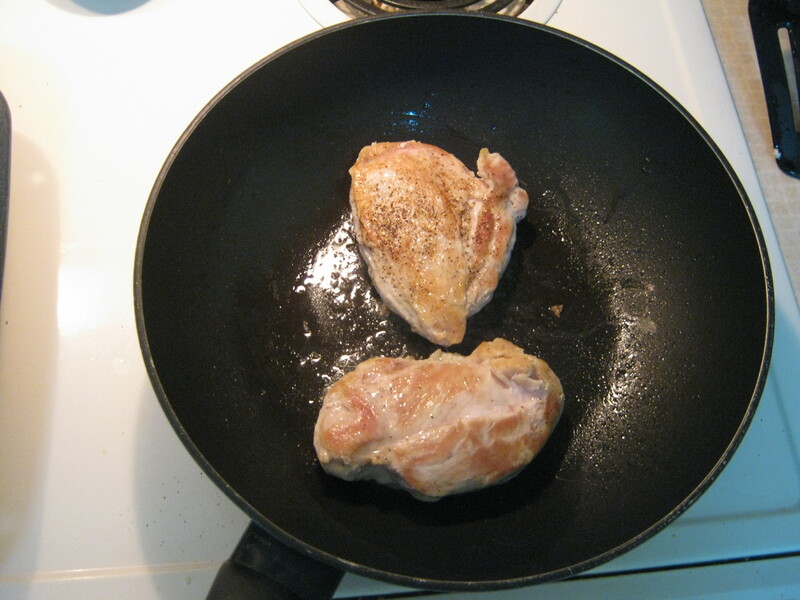 I decided to cook the chicken meal first since it has ingredients that will go bad faster. 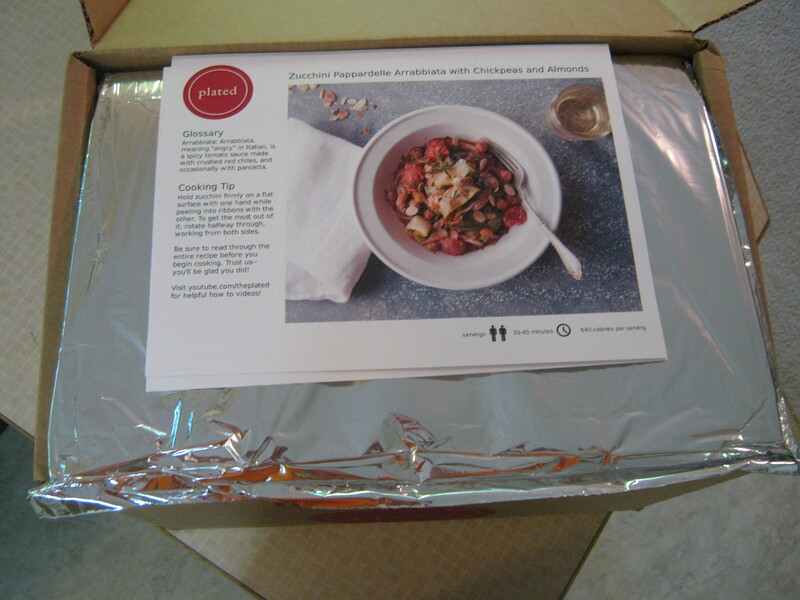 The recipe card comes one very nicely printed piece of 8 ½ x 11-inch paper. On one side, you will find the recipe and on the other, cooking tips and a glossary of cooking terms used throughout the recipe. When I signed up for the program, I knew it would help me eat better and cut down on my pasta intake, but I didn’t realize that I will also be learning valuable cooking skills as well. Step 1 on the recipe was to Prepare Ingredients. 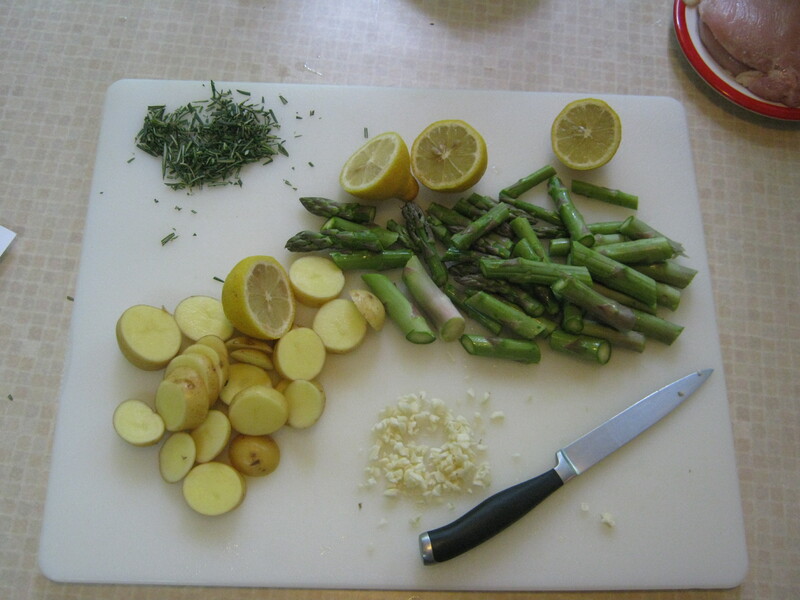 This was easy, the hardest part was chopping rosemary, i would have to sacrifice freshness, but I think I would rather have that come pre-chopped, primarily because my knives are sharp enough to chop that type of plant very well. Chicken has always somewhat intimidated me because it can make you so sick if you do it wrong. They also noted in the directions that it was natural to have a slight “odor” to your chicken after it has been vacuum packed. They were right, it smelled sort of like the vinegar we use at Easter to dye eggs. I decided to trust them on this one and go with it. And, with the helpful cook instructions, I felt like I could be successful. The worst part was handling the raw meat. Call me “chicken,” but uhgggg. There were a couple other challenges as well. First, I didn’t have any olive oil. I know, at this point you are probably asking yourself, who is this girl? Stick with me. I did have coconut oil. So, I used that knowing that my version may come out tasting a little more tropical than the chefs at Plated imagined. 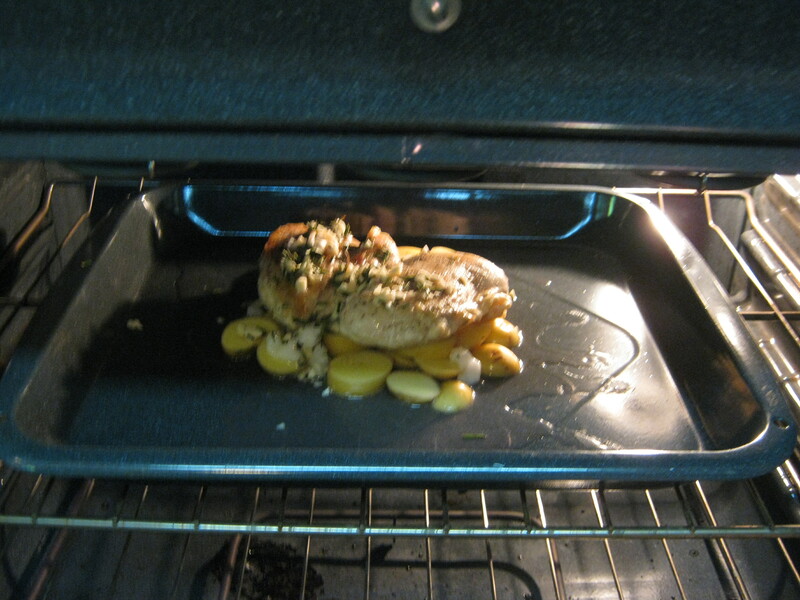 Second, I don’t have a “large oven-proof pan.” I think all my pans are from Ikea. Likely not oven-proof. So I had to improvise a little. Regular pan + some sort of oven dish (I need a glossary for my ovenware too). In the end, the chicken seared a beautiful golden brown. Ah yes… really this should be step 2.5 since you need to be doing it while the chicken is searing. I, on the other hand, was writing the introduction to this blog. So, I found myself in a bit of a pickle when the chicken was done searing and there was no sauce yet made. In Plated’s defense, they did specifically call out that I should read the whole recipe before beginning. They tried to warn me. Instead, I just moved the chicken off the burner and made the sauce. Seems like it was okay, no burnt chicken and no missing sauce. Remember how I mentioned that I don’t have an oven-proof pan? I had to somewhat wing this step with my make-shift oven dish. The main issue with not using the pan is that the sauce kind of runs all over the place and isn’t well contained around the potatoes and chicken. The other issue was the fact that I was using coconut oil which is clumpy at first. I just spread the lumps around hoping it would melt somewhat evenly while in the oven. What ended up happening is the sauce sort of burned around the pan, but it still smelled delicious. When the timer went off at the minimum time recommendation of 15 minutes, I pulled out my dish, and checked the center of the chicken for pinkness. I didn’t see any, but because I am afraid of chicken I put it back in for two more minutes. Uhg, so blurry – Sorry! This means, transferring potatoes back into the original pan and adding the rest of the prepared veggies. I was a little concerned because their photo showed a lot more liquid in the pan and since I burned all mine off, I thought I may need to add more. 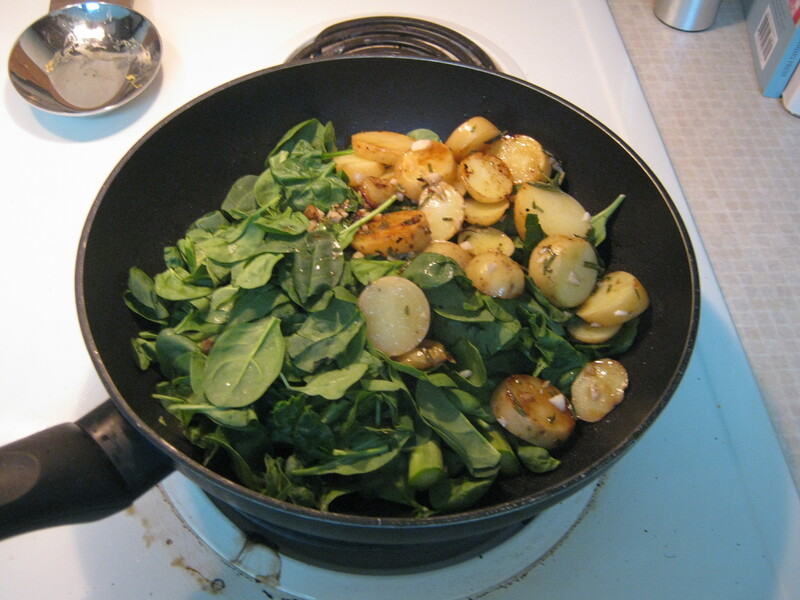 But, after the spinach wilted, it looked a lot better. 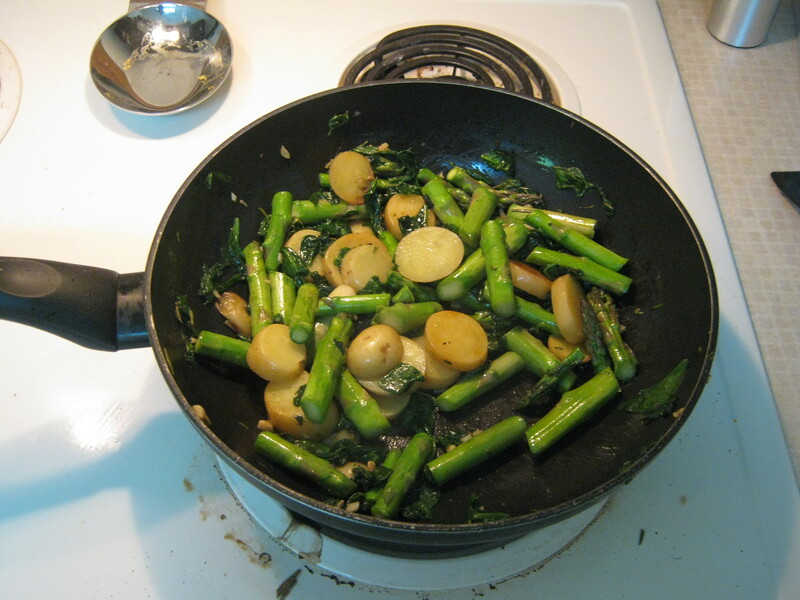 Their directions said it would take about 3 minutes, but since my asparagus was really thick, much thicker than any asparagus I have gotten at the grocery store, I left it on for a few extra to try it to soften. Overall, a very easy step. Sounds easy, right? Well, their photo looks amazing while I had asparagus rolling around and spinach flopping. I cleaned up the dish a little and I think it turned out pretty appetizing. Sure smells that way! Unfortunately, I had a family birthday dinner I had to attend that night so I couldn’t eat all of one serving. I did taste it and am amazed at what I have created with the help of Plated (also, no hint of coconut)! Truly, this is something I would normally never have considered for just an average day dinner. I am so happy with how this first dish turned out. My inner chef has been unleashed! And, I bet I can tell you who is going to have the best lunch in the office tomorrow! As part of the packaging, Plated sent two giant freezer packs that I have no idea what to do with now. Am I going to get these every week? The customer service is closed on Sunday, so I will have to chat with them tomorrow and find out. **UPDATE** After talking with the customer service, they informed me that the ice packs are non-toxic so they can be tossed. Definitely! I am thrilled with my first meal and cannot wait to make my second, Zucchini Papparadelle Arrabbiata with Chickpeas and Almonds (that’s a fun one to type). I have also set my account to auto select my meals based on my menu preferences. I am lactose intolerant and don’t really like spicy foods so I eliminated those from my meals. Looking forward to what comes next Saturday! Interesting in trying out Plated? Check it out here! The tone of March: Book One, the graphic novel of the first part of Congressman John Lewis’ life and role in the Civil Rights Movement, was primarily depicted through the way the design of the pages, the location of the words, and the stylistic decisions made throughout. These stylistic traits really crafted the experience and feeling s of the story while reading. First, the whole book was in black and white, immediately highlighting the differences and separation between the whites and black in society at the time. The fact that there was frame around the whole story and that John Lewis was telling the whole story from first person but to an audience drew you in as though you were those little boys in the office talking with the congressman as well. This frame also ties the novel inseparably to the speaker, Congressman John Lewis, and his life story. The imagery in the book was dramatic with dark shadows further darkening the black and white on the pages. For example, on page 93, when they are describing one of the sit ins, the whole page illustration while they are all sitting at the bar and there is just one word “klik” resounding throughout the day. The anticipation builds as you take in the whole scene. In this frame, you see a lot of black filling the page, which is interesting because it contrasts what the environment would likely literally look like. Instead, the diner is likely brightly lit, the darkness highlights the tension, the insecurity, and the fear that is present in the room. You also see fear and determination on the characters faces who are participating in the sit in. In the background, you see the white people who are angry, standing with crossed-arms and formed almost as a wall, a resounding force in the frame as well. Contrasting that, when the congressman is talking in his office with the boys, there is a lot more white on the pages and a lot more humor throughout the language. In fact, this is the only place where humor pears in the novel throughout. It is presented through the naiveté of the small boys with the questions that highlight how far the society has come since the Civil Rights Movement. What is also apparent, is the aging that John Lewis has gone through. The book of course, only covers the first part of his life and his entrance and rise in the Civil Rights Movement, so the distance in time is even more apparent. While John Lewis is more than willing to share his story with the children and mother, he also appears very strained while telling the story, very exhausted. This shows how his work in the Civil Rights Movement has worn on him, it has become a part of who he is, it is apparent in his outward physique. Why Congressman John Lewis chose to present his autobiography in a graphic novel is an interesting thought. I didn’t do research to find his official answer on this, because I wanted to first consider what benefits he could take advantage of. First thought that comes to mind is the idea that this format stands out amongst other biographies, however, I do not feel this is enough of a reason to publish in this format. Maybe, the main advantage is this style makes the feeling, the experience, and the tone all very experiential. Like discussed above, you feel drawn in to the scene, you see the emotions, the colors (or lack thereof) tell you what the scene felt like instead of depicting what it actually looked like. This is very difficult to accomplish through words on a page, especially in a typical auto-biography which can be very dry and lack that same descriptive ability. One other note, I wanted to mention, I read the book on both the iPad and in a hard copy and I feel that that the intensity of the imagery came through substantially more dramatically in the hard cover version. Part of it was due to the tactile aspect of holding the pages, but the main effect was the intensity of the illustrations was more impactful. The back lit screen of the iPad removed the darkness from some of the scenes. And the technology added a layer of detachment from the time period being described. Overall, I thought the choice to write in a graphic novel was very effective and the stylistic choices made throughout only added to the experience of reading. The fact that this is only book one, and the story cuts off somewhat abruptly, builds anticipation for the next book. However, this also left you with a sense of lack of closure. On the other hand, this could have been intentional, as Civil Rights is still an issue in many parts of our society. The work is not done. The story is not over. Give and Take has been a very interesting read. While I believe I am definitely on the far side of the Giver spectrum, I was uncomfortable with the villainous descriptions of the Takers. There are people who are self-serving, who will do anything to get to the top, who take all the credit and who believe that they are better than other people, but no one is arguing (except maybe those people) that is an effective way to do business. How many companies do we see fall into scandal while being led by a leader that fits this description? Also, I believe there is something to be said for the incredible and invincible self-confidence it takes to create a company and believe it will be industry changing. This type of genius and bullishness may not be appealing, but it is still incredible and impactful. This is reminiscent of the fine line between genius and insanity. Overall, I found the analysis of the success of Givers in various situations interesting, but limited because it appears that every study proves his point, and when it doesn’t prove his point, he stretches the scope of perspective to the point where he is supported. I also felt there were too many case studies or scientific experiments mentioned. One or two per concept is sufficient rather than three. The book may have been more efficient to cut out 100 pages, however, perhaps this is a side-effect of being a Giver – you just want to credit everyone and give them their time to shine. I did enjoy considering what type of person I am and the type of people I work with. I was able to better understand the behaviors of some of my co-workers with this added information. For example, it becomes evident how ineffective taking a Matcher approach can be in the workplace, maybe even less effective than the Taker in the long- and short-run. I took the quiz on the Give and Take website to see if I am accurate in my assumption of how I fall within the spectrum (at least based on how I see myself!). 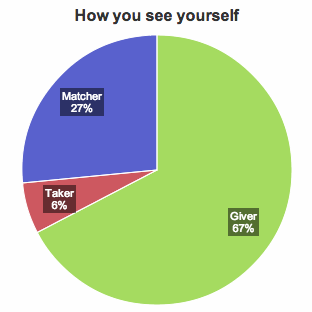 It turns out that I am mostly on the giver side but I also have matcher and taker tendencies.